The beginning of the school year is my time to reflect on what worked from last year and what didn't. Returning to school refreshed and relaxed always motivates me to try something new in the speech room. This year, I wanted to find an alternative to sticker charts and treasure boxe s in speech therapy. 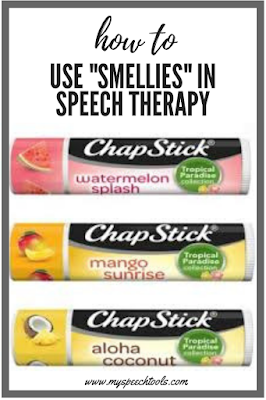 The early childhood special education teacher and PreK teachers on my campus were using flavored lip balm on the back of little hands as a tangible reward for sitting during carpet, or completing work in a learning center. I started off the year experimenting with this reward system and realized that PreK students were not the only ones motivated by my "smellies." Turns out that three year-olds and fifth graders all love smellies in speech therapy. 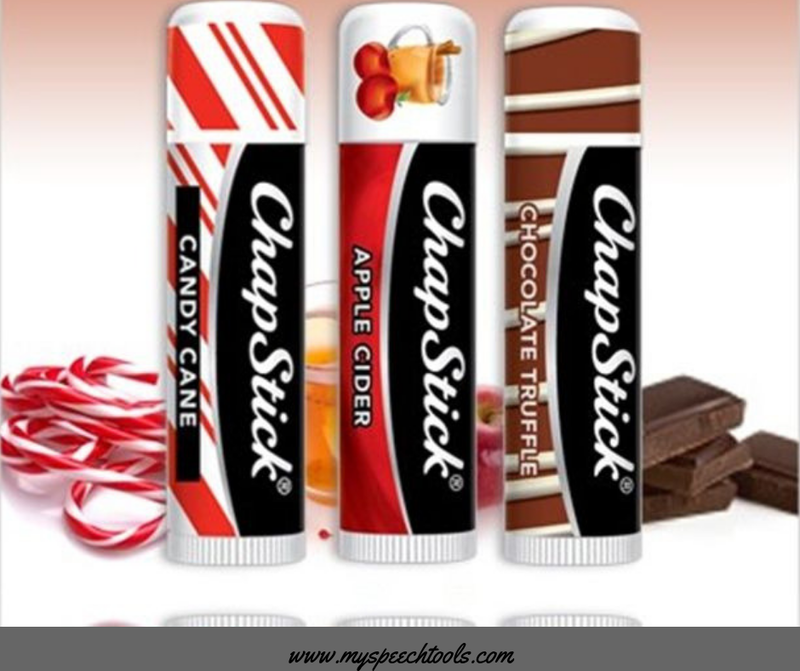 You can purchase several flavors of lip balm for $1 each, and you'll have enough to last the entire year. 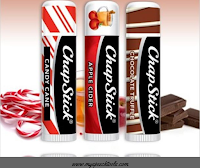 But after a couple sessions of smellies, I discovered there are so many more uses for flavored lip balm than just a reward for good behavior. 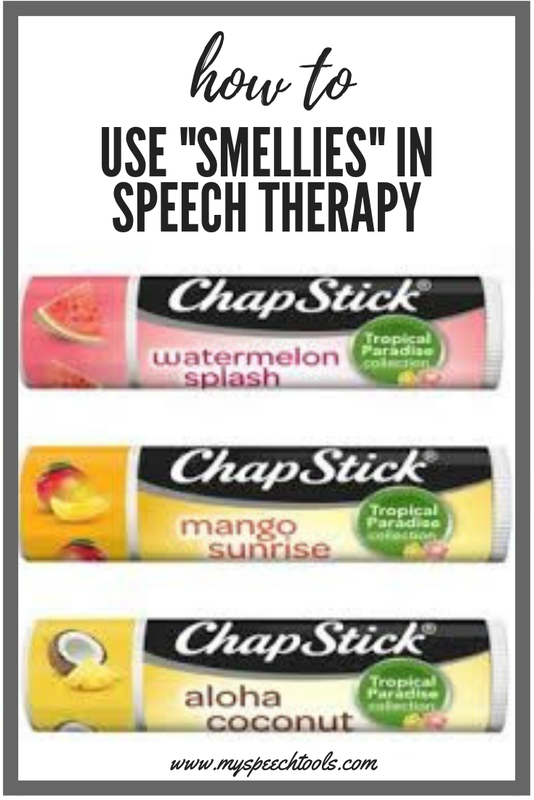 Smellies in speech therapy can provide aromatherapy and sensory benefits, as well as a meaningful addition to your thematic literacy and language activities. Scientific studies suggest that olfactory stimulation can alter cognition, mood, and social behaviors. The sense of smell can also affect working capacity, short-term memory, task endurance, and emotional stability. (Amazon affiliate links are provided). Seasonal flavors can easily be paired with thematic lessons. Pair the green apple lip balm with your fall apple theme books for added sensory experiences. The Apple Pie Tree is one of my favorite fall read alouds. Students experience the aroma of fall rubbed on the backs of their hands long after listening to the read aloud. During the winter holidays, help your students connect with the season by using the pumpkin pie, gingerbread, candy cane, and cinnamon flavors. Bring stories to life by allowing students to smell flavors during related holiday activities. Merry Christmas, Splat and Sneezy the Snowman are two of my favorite holiday books that could easily be paired with smellies. Peppermint is known to raise alertness, stimulate short term memory, and decrease anxiety. Cinnamon, on the other hand, is known for its calming affect and ability to decrease stress. A few of my students who struggle with self-regulation and attention to task are learning to take charge of their behaviors by taking deep breaths in through their noses with a peppermint Chap Stick smelly. I think it's a combination of increased awareness, aromatherapy, and deep breaths that are helping students to regulate their own behaviors. I've also noticed that students will request the smelly that makes them feel good and the one that helps them relax the most. When I think about Spring and Summer, I automatically think of tropical fruit flavors. Coconut, strawberry, watermelon, cherry, peaches and cream, blueberry, key lime pie, and fruit punch are fun flavors. Let students smell the lip balms and guess the fruit. Identify the fruit and match the smell to picture symbols. Have students vote on their favorite and graph the results. I recomend "The Runaway Bunny" as an ideal book units to combine with smellies. What is something different you've tried this school year? Was it a success? I'd also love to hear how you use sensory activities in your therapy. Leave a comment below and share your experiences and ideas.